With a freshwater pool, a full-service spa, a fitness center and multiple restaurants and bars, the Royal Solaris Cancun - All Inclusive also offers our guests a beachfront location. Set on a white, sandy beach, the high-rise resort has 300 rooms, some with balconies and all with satellite TVs, clock radios with CD players, nd in-room safes. Wi-Fi is available for an additional fee. The three restaurants range from fine dining to a complimentary American buffet breakfast, casual terrace lunches and snacks bars. A lobby bar and a poolside/swim-up bar are on-site. Guests can schedule a massage or beauty service in the spa, while the kids have their own adventures at the Kids' Club. Everyone can meet up later at the mini-water park or at the huge, two-level pool for family fun, or they can simply relax and enjoy the ocean view from the sun deck. Amenities include a fitness room, a business center, a newsstand and valet laundry service. The hotel provides a marina with pedal boats, windsurfing gear and other water sports. The hotel is 20 minutes from downtown and 14 miles from Cancun International Airport. The convention center is a 15-minute drive. Cancun's aquarium, where guests can enjoy interactive exhibits, a dolphin show and even swim with dolphins or sharks, is a 10-minute bus ride from the hotel. Tours provided by the hotel include snorkeling at the National Marine Coral Reef Park or at Isla Mujeres and day tours to Chichen Itza. our guests say the "delightfully prepared, excellent food," the "spacious rooms" and the "good location right on the beach" make the Royal Solaris Cancun - All Inclusive "worth the money." 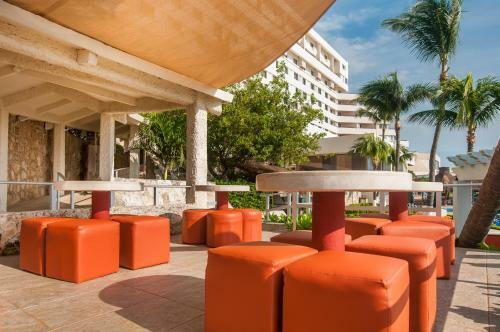 Royal Solaris Cancun is an amazing Cancún lodging choice for your trip to Mexico. With numerous amenities for guests such as 24 hour front desk, restaurant, gift shop, you will wake up at Royal Solaris Cancun feeling invigorated every day for your time in Cancún. Don’t let this amazing reservation opportunity pass you by, book your stay at Royal Solaris Cancun today to make the most of your time in Cancún, Mexico.